A traditional renaissance portrait of a Queen with a modern and super quirky twist! 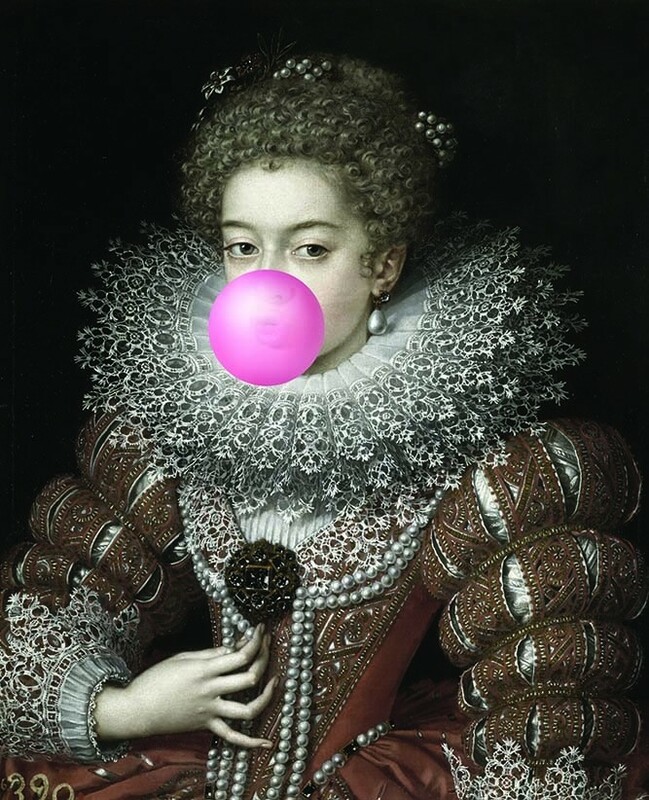 The regal Queen in this art print is playfully blowing pink bubblegum from her mouth. How damn fantastic is that?! The Queen Pink Bubblegum Portrait measures 66cm x 81.3cm in a black colour box canvas frame. Down right quirky and oh so fabulous, the regal, poised and elegant Queen print will never fail to make you smile. A mischievous Queen blowing bubblegum, the artwork will be loved by anyone who is looking to inject humour, wit and character into their home. We also think that the Pink Bubblegum Queen Portrait Canvas would make a rather lovely gift for that naughty friend or family member who loves cheeky homeware and artwork that makes them laugh. 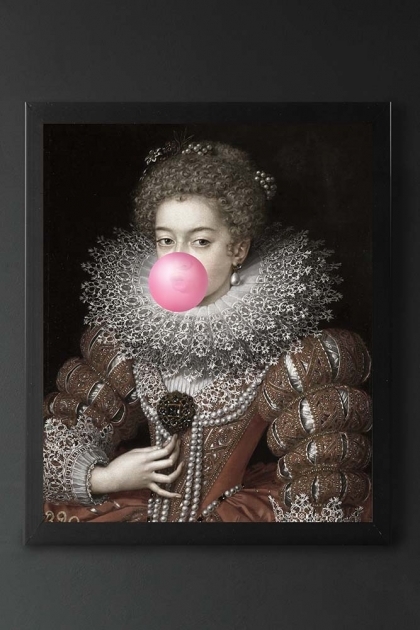 Delightfully unique the Pink Bubblegum Queen Portrait Canvas would look great just about anywhere in the home, but we think it would look particularly great as part of a picture wall. A picture or gallery wall is a great way to show off your favourite artwork and to get creative with your home interiors too! Easy to do, follow our simple steps below to create a picture wall with your Pink Bubblegum Queen Portrait Canvas. 4. Once you’ve decided upon your chosen arrangement it’s time to get hammering! Measure the distance between your artwork as accurately as possible and hammer nails into the wall to hang your art on. A really fantastic print that we know you will love, there are a number of other prints in the collection that we think you will love including The Pink Pencil Canvas With Printed Frame, The Ostrich Canvas By Angela Rossi, the Still Life Canvas Print – Yellow, the ‘Air’ Canvas With Printed Frame and two other Bubblegum Canvas’.